It's varnishing day in the Studio. 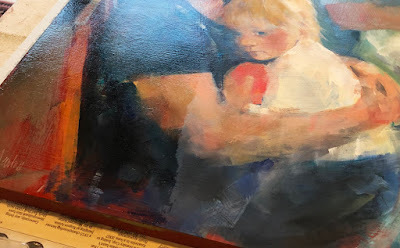 This oil painting was completed several months ago and in this photo you can see the difference the Gamvar Satin varnish makes. It brings color back to life, evens out the paint, especially when a medium is used with the oil paint and protects the surface from dust. 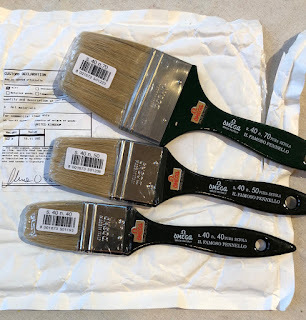 I updated my varnish-only brush to three from the UK. I hung my varnish brushes on the wall with my gesso brush so they'll never get mixed up with my painting brushes. Go to the Gamblin website to see videos about how to varnish with Gamvar.